On June 28, 1914, Archduke Franz Ferdinand, heir to the throne of the Austro-Hungarian Empire, was assassinated in Sarajevo. One of the most savage wars ever witnessed by humanity would ensue, raging for four long years across several nations, and continents: the First World War would become known as the Great War, and would eventually annihilate some 10 million soldiers and 7 million civilians worldwide. The Ottoman Empire, which entered the war on the side of Germany and against the Allies (France, Britain and Russia) was not spared its savagery: the total number of casualties in the Ottoman Empire reached 325,000 deaths; 400,000 wounded;1,565,000 prisoners of war. In Greater Syria, famine and epidemic disease spread, killing 100-200,000 and sending untold thousands into poverty. Besides all the human and capital losses, World War I would leave a deep impact on the Middle East, the Arab nations, and Lebanon, by changing the shape, fate and identity of many of its nations. The Great War also left a deep impact on the Syrian Protestant College (SPC), as AUB was known then. 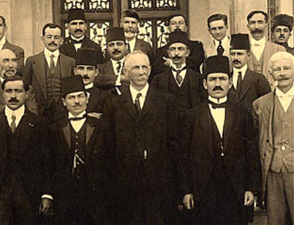 How did the Syrian Protestant College, an American College established by Protestant Missionaries in Beirut in 1866, fare during these trying times? How did SPC, with its multi-national and ethnic student population, its faculty strongly rooted in American missionary values, its blooming professional schools (Medicine, Pharmacy, Nursing, Dentistry, etc.) cope with the many challenges the war presented? In this exhibit, we try, through focusing on select documents from the Archives of the AUB University Libraries, to retrace this fascinating trajectory, showcasing photos, letters, reports, diaries, documents, etc., which bear witness to the practicality and flexibility of the College administrators, to the vision and steadfastness of the Faculty and student body, to the grassroot engagement of SPC with the community, and to the increasingly influential role that SPC, and AUB, were destined to play in the region. The story that emerges is also a testament to the influence of the war on the outlook of the early Protestant Missionaries, and to the test it put some of their values, goals and outlook; it is a witness to the resilience of the human spirit, to the interplay between grim realities and ideals, but perhaps most of all to the advent of a new era, and to the rise of AUB as an American Liberal Arts College dedicated to teaching its students, what Bliss had already called, in 1914, "reflection", a skill, a "Cultural Orientation", "a vital apprehension of truth that leads to wise and energetic action", one that is forward looking, and that is rooted in its surroundings, and in a culture of service. Acknowledgments: Many thanks go to Dr. Tylor Brand for helping correct some of our errors, and for his enthusiasm and support; to Ms. Iman Abdallah for background research; to Ms. Dalya Nouh, Mervat Kobeissi and Yasmine Younes for their support in content development, and to Mrs. Badaro for providing us with some archival material.